Are you addicted to lilies? So am I! I’ll be speaking about growing them successfully. If you would like to come, let me know so I can let the event organizer know to save you a seat. Categories: Hive Happenings | Tags: liliies, speech | Permalink. My husband and I were unable to have children. Instead I turned my focus to my garden and created a personal sanctuary to ‘heal’. My children are in their gangly teenager phase now. Most requiring a serious haircut this spring. When people visit our garden, the first words uttered are “Wow, this is really peaceful. This is Beaverton? I can’t put my finger on how this garden makes me feel.” Transformative is the word I often use. On Mother’s Day I generally hop in the car and head to the beach. I hike the well beaten path from Ecola State Park down to the beach. My goal? Avoid the media Hallmark moment onslaught. I liken Mother’s Day to Valentine’s Day. I desperately steer clear of the dazed-eyed crowds at Costco, Fred Meyer or the mall searching for the perfect last minute gift and card. I implore you dear reader to make every day Mother’s day in your home. Instead, this one day should be relegated to those of us who wanted children and could not have them. A mourning day for life not created, but so desperately desired. My goal would be to change this ‘holiday’ into a national gardening day where we celebrate new life in whatever shape or form it takes. Categories: Garden Poems & Ramblings | Permalink. May 17 – 18 as well as May 31 – June 1. Oregon’s largest woody ornamental growers of trees and shrubs opens their doors once a year to the public. I recommend going if you are searching for the perfect specimen tree to add into your landscape this season. When I worked at GWN, I was assigned the Simon Cowell, American Idol judge, backyard boxwood project. That story is for another day and multiple blog postings. Make sure to stop by Blooming Junction which is on the way. Grace Dinsdale from Blooming Nursery opened a landscape yard April 26 to sell her fabulous perennials directly to the public. Categories: Hive Happenings | Permalink. I am excited to be going to the Garden Writers Symposium in Tucson, Arizona October 12 – 19. I will be passing out “Sweet Treats” like I did at the FarWest show. Hope to see you there. What a difference a year makes! Last year I was at Kraemer’s Nursery as their New Product Development Marketing Coordinator. This year, I am assisting Maria Zampini launch her new business UpShoot LLC. UpShoot assists ornamental woody shrub and tree growers nurture new plants into successful products marketed to chain stores and independent garden centers nationwide. It’s been really busy getting ready to strut our stuff at the FarWest Tradeshow in UpShoot’s Booth #2047…. from the website, pot wraps, tags, enewsletter campaigns and more. I would love to have the chance to show all of this to you in person! One day only FREE event sponsored by METRO and OSU Master Gardener Program. My garden is being featured with six others on the West side for its sustainability practices. 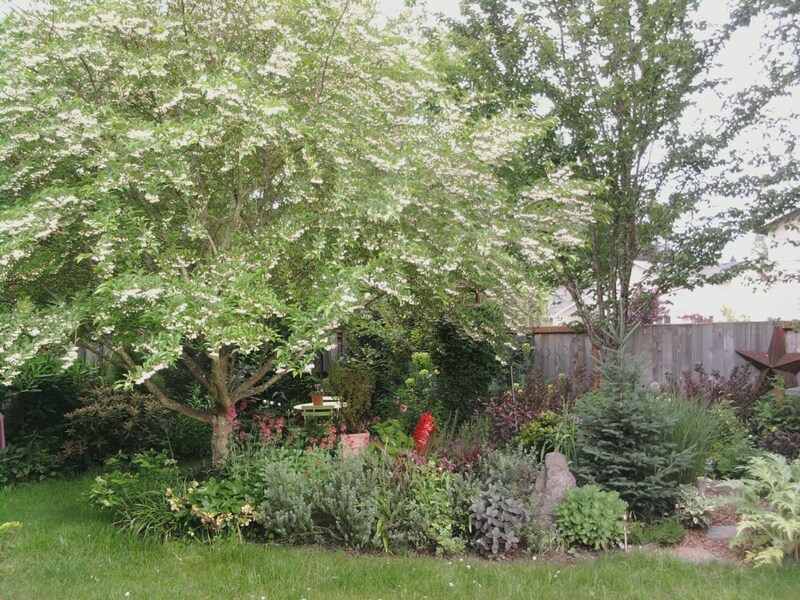 Tried and true ornamental trees, shrubs and perennials mix with new introduction trial plants from Skagit Gardens, Proven Winners and Plant Haven while rubbing shoulders with native plants.